Doing remodeling work is full of uncertainty. A very good scope of work and estimate is a way of reducing, not eliminating, risk. All this planning is pointless if the job is approached as simply manipulating materials. 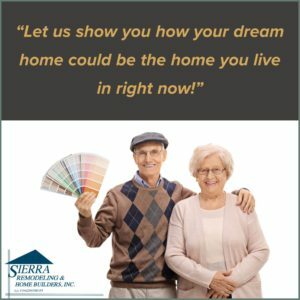 Instead of looking at the project as a lot of things to be done, Sierra Remodeling sees it through your eyes. To ensure our employees know what this means, we instill best practices into their training and, they are known as The Home Remodeling Customers List of Expectations. Sierra Remodeling is committed to providing each home remodeling customer with an excellent experience. Many homeowners have come to expect the nightmare remodeling project that is so prevalent in the remodeling industry. We would like to change that. 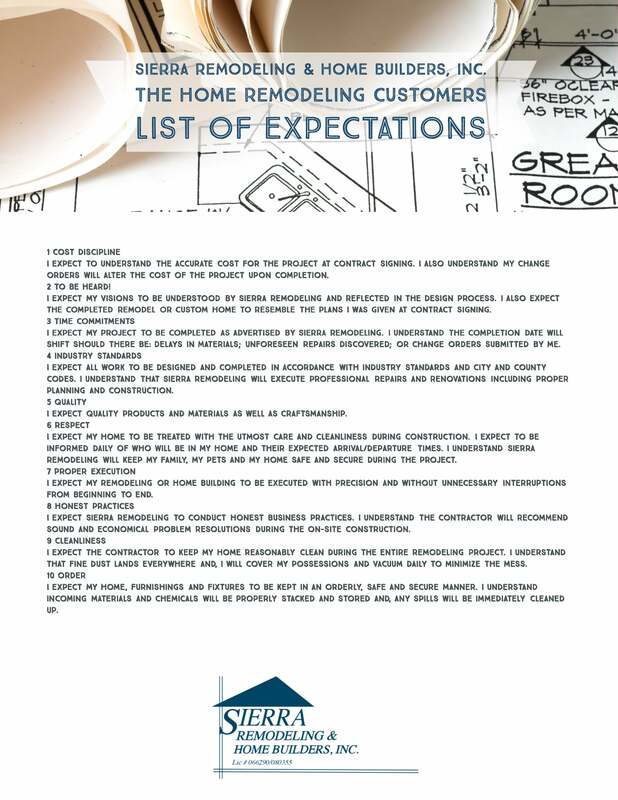 Our Customers List of Expectations is a “bill of rights” by which you can set your expectations for any home remodeling project. The standards set forth in this document can be used to measure the performance and the experience you receive from a remodeling contractor, whether you hire us or someone else. I expect to understand the accurate cost for the project at contract signing. I also understand my change orders will alter the cost of the project upon completion. I expect my visions to be understood by Sierra Remodeling and reflected in the design process. I also expect the completed remodel or custom home to resemble the plans I was given at contract signing. I expect my project to be completed as advertised by Sierra Remodeling. I understand the completion date will shift should there be: delays in materials; unforeseen repairs discovered; or change orders submitted by me. I expect all work to be designed and completed in accordance with industry standards and city and county codes. I understand that Sierra Remodeling will execute professional repairs and renovations including proper planning and construction. I expect quality products and materials as well as craftsmanship. I expect my home to be treated with the utmost care and cleanliness during construction. I expect to be informed daily of who will be in my home and their expected arrival/departure times. I understand Sierra Remodeling will keep my family, my pets and my home safe and secure during the project. I expect my remodeling or home building to be executed with precision and without unnecessary interruptions from beginning to end. I expect Sierra Remodeling to conduct honest business practices. I understand the contractor will recommend sound and economical problem resolutions during the on-site construction. I expect the contractor to keep my home reasonably clean during the entire remodeling project. I understand that fine dust lands everywhere and, I will cover my possessions and vacuum daily to minimize the mess. I expect my home, furnishings and fixtures to be kept in an orderly, safe and secure manner. I understand incoming materials and chemicals will be properly stacked and stored and, any spills will be immediately cleaned up.